Maggie is best buddies with Dominic. Charlie is best friends with Julie. Through the magic of the Internet, they set up their pals on the most romantic blind date ever. Naturally, Maggie and Charlie tag along for moral support-what are best friends for? Yet when the two matchmakers meet, their concerns for their charges take a backseat. As Maggie looks at Charlie, she thinks she feels the earth move. Laying his eyes on his fellow Cupid, all Charlie can think about is kissing her delectable mouth. Shes involved with someone. Hes Manhattans most committed bachelor. What will it take for a pair of modern matchmakers to realize this simple truth: that when it comes to finding a soul mate, true love can be found when you least expect it? One glance at the title and cover, you would know that this is a chic lite through and through. 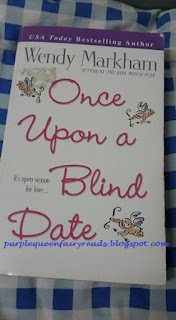 However, for a chic lite, Once Upon a Blind Date wasn't really that cliche and perhaps due to the light and cheerful writing of the author, it wasn't boring as well. Predictable, yes, very much so! For those romantic at heart, you would love the theme of opposite attracts as the two of them couldn't be more different. However, the difference was not the focus of the storyline but more their effort to matchmake someone not so interested to be matchmade. For those relaxing brainless time that I need one and off, I recommend Once Upon A Blind Date.